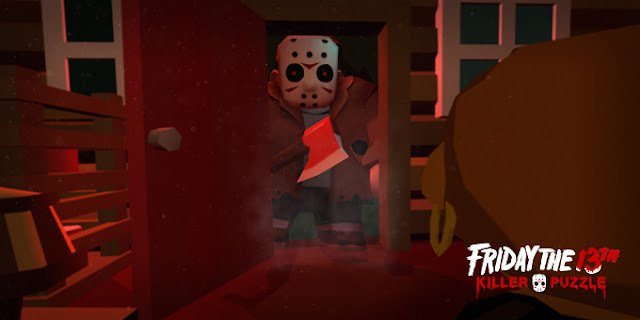 From the makers of cult hit Slayaway Camp (“Darkly hilarious, 5/5” - Rue Morgue) comes the most gruesome and terrifying puzzle game ever, featuring legendary horror icon Jason Voorhees stalking and slaying campers in Crystal Lake... and beyond. The “Worldwide Super Globo-Mega Launch” is set for, naturally, Friday, April 13, and will include iOS, Android, and Steam versions across all territories. Players control Jason by sliding him around an isometric puzzle level to attack his victims, either directly with a huge variety of unlockable weapons, or indirectly, by frightening them into environmental hazards like campfires, bear traps, and woodchippers. Grisly reflex-based “Kill Scenes” punctuate the puzzling as you progress through multiple episodes, from classic campgrounds to more exotic locations such as Manhattan, abandoned amusement parks, supermax prisons, beach resorts, outer space and even, through a time-travel twist, Victorian London and other eras.